BUILD STRENGTH & FLEXIBILITY - The Finger Stretch Exerciser by Powerball® is the perfect product for anyone looking to develop finger grip strength and dexterity. It is an ideal complementary product for Powerball, as it affords the user gentle concentric and eccentric exercise to go along with the isometric exercise of the Powerball gyroscope. 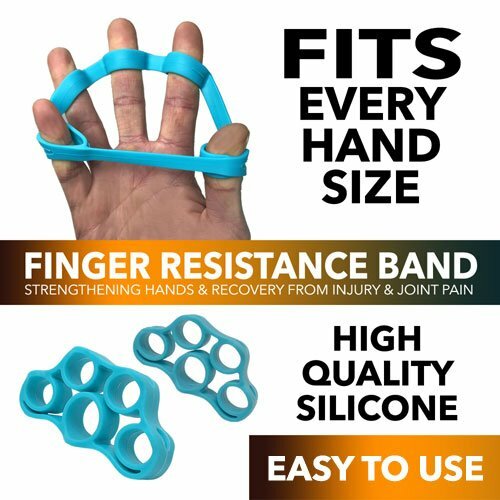 IDEAL FOR ATHLETES & MUSICIANS – The ideal exerciser for sports people who require a high level of finger strength and grip power (rock climbing enthusiasts, golfers, racket sports players, cross fitness, etc.) as well as musicians (guitar, piano, drums and more). REHABILITATE INJURY – The Finger Stretch Exerciser is perfect for rehabilitating weak muscles post-injury and for gradually building strength back into your hand and fingers. THE PERFECT DESK STRESS RELIEVER - Keep the Finger Stretch Exerciser by your desk for regular strengthening and stress-relief sessions at the office and combat any symptoms of computer-related RSI (repetitive strain injury).